Tent footprints and tarps are essentially similar when you look at them, but they are designed for different purposes. The tarp is a little thicker and will be less likely to leak, while the tent footprint will be the exact size that you will need to place underneath your tent and ensure that the elements do not get in from underneath. We have decided to look a little deeper at the tarp and the tent footprint and show you exactly what the main benefits are of using each and how they can also be used in conjunction with one another on your camping trip. Why only keep your protected from one part of the elements, when you can ensure your tent is fully protected. Is tent footprint worth it? The tent footprint is designed to fit underneath the tent and it is usually a tough and thick cloth-like product that will protect the entire underside of the tent. Friction is generally caused on the floor of the tent when we move in and out and when we sleep. Since the materials used for the floor are still durable, they are quite thin and they might get worn out quite easily. By adding a good tent footprint, you will be saving yourself from these abrasions and also getting a thicker floor cover to reduce the impact caused by the friction. We know washing the ten﻿﻿t is already tough and if you do have the opportunity to invest in something that will save you time, why not? The tent footprint is designed to take in all of the dirt and the mud that might be on the ground where you camp and keep the floor spotless. This means that once you get home, you could simply just pull out the footprint and hose it down. You should also remember to let it dry thoroughly. The rain will fall from time to time and sometimes you might find your tent sitting in a hole of sorts. This will cause the rain water to start building up and soaking the floor of your tent and if you do not have some sort of elevation inside, you will be sleeping in a puddle. 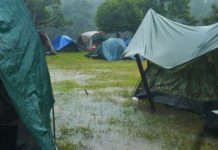 While it is never recommended to set up your tent in a hole, this can be unavoidable sometimes and the tent footprint will ensure that you do not get soaked on the inside, which should give you time till morning to move the tent. Definitely is our answer. The tent footprint is not a necessity, but with the prices of tent skyrocketing, paying a mere $30-$40 will be a decent investment when it comes to keeping your tent safe and secure from the elements. 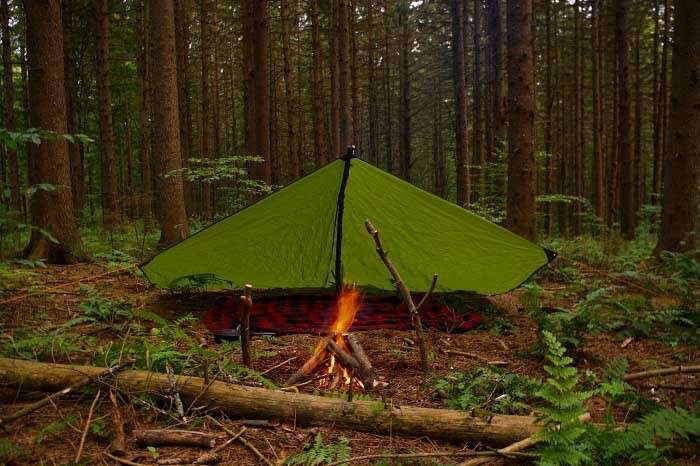 The tarp is quite similar to the tent footprint and it is also designed to keep the water away from you. We like the fact that the tarp is a little more stretchable and will be easier to pull and cover bigger areas. While the tent footprint is ideal for the bottom of your tent, the tarp will ensure that your tent is covered at the top. The tarp is durable and will be much stronger than the tent itself. This will be great for times when the snow sets in and it will keep that heavy weight off the tent. The sun might also damage the materials of your tent, but with a tarp, your tent will have permanent shade to reside under. The tarp is really multifunctional and many people do use it as a footprint and even for picnics. The tarp is not only designed for your tent and if you decide to enjoy the night outside in your hammock, you will be able to use the tarp and ensure that you don’t get wet when it starts to rain. One brilliant thing about the tarp is that it is rally fast to set up and will only take a few minutes when you have the skills. No additional items are required and the tarp is actually quite cheap as well. We could also add that the tarp is designed to clean easily and with a simple hosepipe, you will be able to hose it down in a matter of minutes. The tarp is certainly worth the cost and this is thanks to the multifunctional use it provides. The tarp is easy to set up and will generally not be more than $30 for a high-quality product. If you want a huge tarp, you might need to dole out a few extra bucks to get the best possible value for your money. Choosing between the tent footprint and the tarp can be quite daunting, but why not consider purchasing both. For car camping, tarp would be fine, but for backpacking, the footprint is a must because tarps are so heavy and bulky. The footprint is the right size for the tent. It's lightweight, packs up nice & compact, and has webbing & grommets at each corner for the tent's poles. The tarp is nice for a shady spot and also a godsend if it's pouring rain. You can put it over your tent to provide shade and protection from rain and sometimes that allows you to skip the rain fly unless the rain is being blown by the wind. 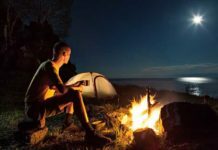 Camping In The Rain Tips, Checklist and Things To Do | Let’s Find Out! 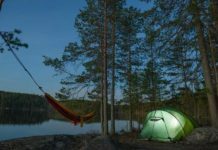 8 Essential Hammock Camping Tips For Beginners – Find Out Now!